This characteristics is the graph of generated no load voltage E against the field current If, when speed of, generator is maintained constant. As it is plotted without load with open output terminals it is also called No load characteristics or Open circuit characteristics. Where Eo = No load induced e.m.f. Thus induced e.m.f. increases directly as If increases. But after certain If core gets saturated and flux also remain constant though If increases. 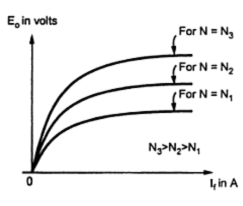 Hence after saturation, voltage also remains constatnt. Note : Thus characteristics is linear till saturation and after that bends such that voltage remains constant though If increases. The characteristics is shown in the Fig. 1. Now the induced e.m.f. also varies with speed. So if magnetization characteristics for various speeds are plotted we will get family of parallel characteristics as shown in the Fig. 2. 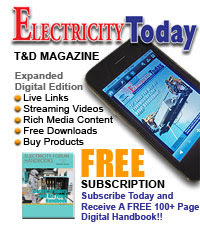 For lower speeds, generated voltages are less so characteristics for lower speeds are below the characteristics for higher speeds. 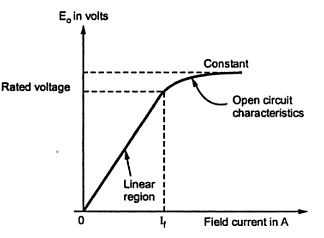 The external characteristics is the graph of the terminal voltage Vt against load current IL. The internal characteristics is the graph of the generated induced e.m.f. against the armature current Ia. Note : While plotting both the characteristics, the speed N of the generator is maintained constant. Note : In most of the cases, the shunt field current is very small as compared with load current IL. Hence in practice, the internal characteristics shows the graph of induced e.m.f. 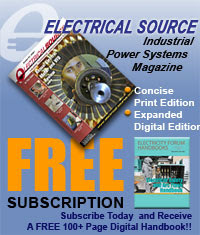 E against load current IL, instead of Ia, neglecting Ish.